Enjoy two boxes of the freshest and juiciest cherries available. 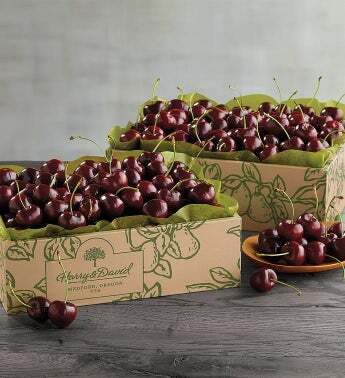 Available during the month of May, these cherries are the perfect sweet treat to share over a late spring weekend. Our Plump-Sweet Cherries are the most crisp and juicy cherries around. Grown in a few small orchards in the Pacific Northwest, these cherries thrive on the cool, wet climate and volcanic soil. That's what makes them so delicious. They are plump with sweet and tangy juice and so firm that they make a nice crunch when you bite into them. Enjoy in a salad or on top of ice cream.